With social media usage still growing, and more and more discussions happening online every day, monitoring your digital presence is becoming increasingly important. Basic social media monitoring, which should be an essential practice, in itself isn’t very difficult, but there are quite a few basic errors and slip-ups you can make which can see you miss key mentions, especially when you’re just starting out. As with all mistakes, the first step to fixing and learning from them is being aware of them in the first place. 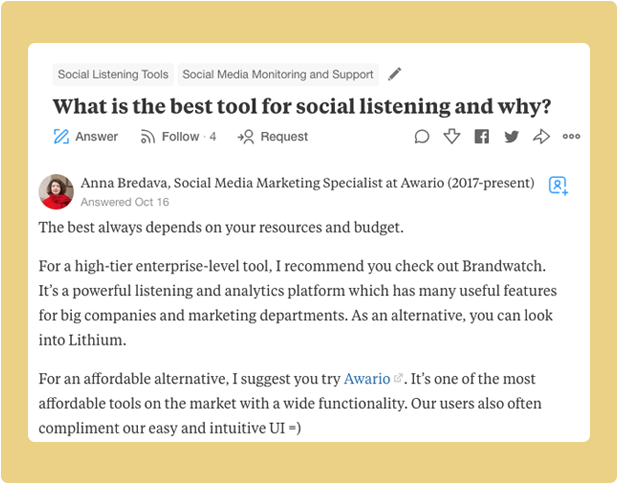 We at Awario used our experience of working with social media marketers to list the most common cases of social listening going off track. Hopefully, this post will help ensure you don’t repeat the same – the tips here are recommended for those who want to give social listening a shot, as well as for those who use a social media monitoring tool and want to make sure they’re doing it right. So let’s get down to the tips. Listening is good, but listening too much can become a problem. For example, let’s say that your brand has a common name. If the guys from VICE decided to track their social presence and used “vice“ as a keyword, they would most likely get tons of irrelevant stuff. 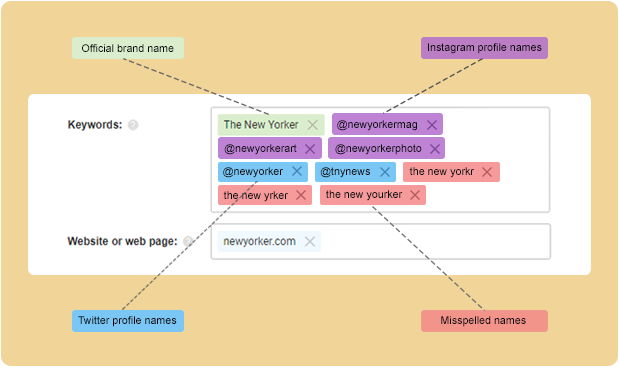 To help with this, most social monitoring apps now have filters that can help you narrow down your search using keyword formats, negative keywords, blacklisting, etc. To reduce the number of posts mentioning generic terms, we can search for “VICE” spelled in upper-case (they are typically mentioned this way), while adding a website URL will highlight mentions where the anchor text of a link differs from your keywords (think of “click here”). 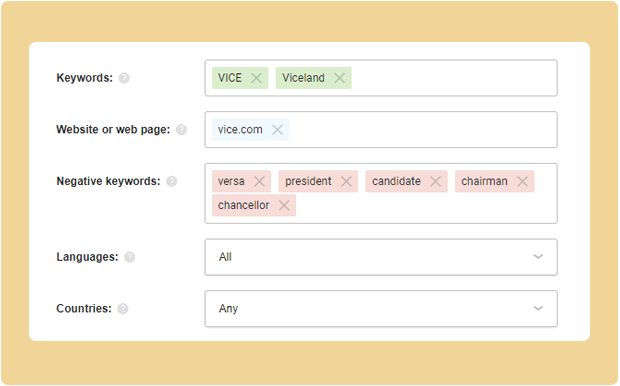 Since “vice” is a common noun which may be used in multiple scenarios, it’s a good idea to add negative keywords, such as “versa”, “president”, “candidate”, “chancellor”, and so on. In some cases, it also makes sense to track only specific countries, languages, and dates. When people try a tool for the first time, they may ignore these advanced options in the rush to figure out what people are saying about their business online. This explains why, after the first try, some people give up forever. Spending some time on reading help docs, watching training videos, or asking support teams for help should do the trick. Sometimes (more often than not) brands have alternative names – abbreviations, different names for social accounts, etc. Some people make typos while spelling brand names, and not everyone uses @mentions to write about a brand online. All this makes the task of collecting mentions more complicated. That’s why it’s very important to do your research and include all the possible variations of a brand name when setting up a query. Remember that while choosing a social listening app, going with the one that lets you add and track an unlimited amount of mentions is key to ensuring you’re across all the relevant coverage. The process of setting up a search for tracking competitors doesn’t take much time, but knowing what people say about them is extremely important. You can use it to connect with their influencers, figure out which part of their product or service customers (don’t) love the most, and learn from their mistakes. 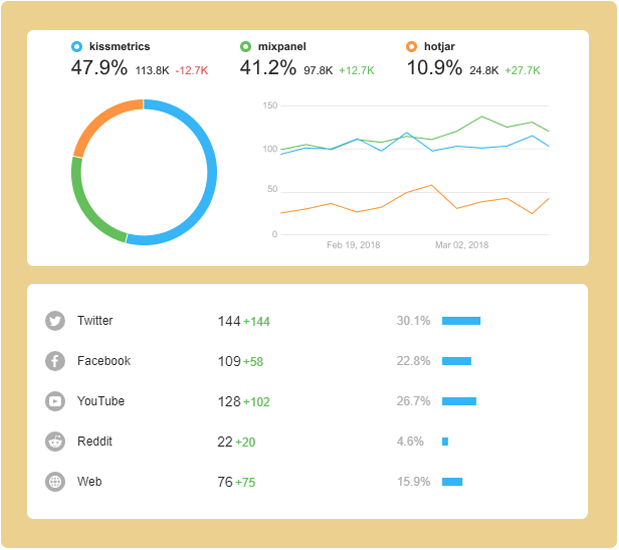 With the help of social listening tools, you’ll be able to get insights about volume, reach, sentiment, and other factors of their mentions, in comparison to your own, which can help in refining your strategy on any given platform. Social media monitoring platforms are evolving rapidly – some of them, for example, already offer dedicated modules that search for sales prospects, you just enter the set of keywords people would use to find your product and you can get the feed full of leads in return. But if your tool doesn’t offer this option, as a workaround, you can use Boolean search, or just monitor your industry keywords. 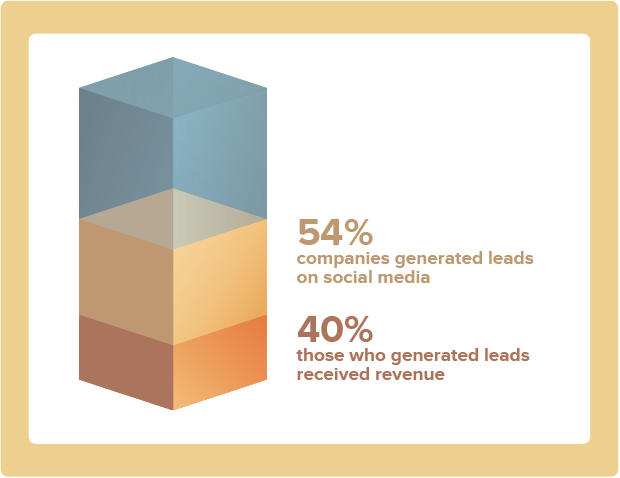 According to Rick Whittington, 54% of companies have generated leads on social media, but less than a half of them were able to convert that into revenue. To increase your chances of turning prospects into real customers, don’t forget about follow-ups – be sure to follow-up with leads in an appropriate manner, and answer any questions they may have. Boolean Search is a way to organize your query using a combination of keywords and Boolean operators (“AND”, “OR”, “AND NOT”, etc.) to generate more accurate and relevant results. And while it’s not an absolute must if you’re just starting out, it will be of a great use for those who aren’t completely satisfied with filtering options – Boolean search can help you uncover dozens of powerful applications for social listening that you may never have thought of, including generating new leads, link building, creating multiple keyword groups and mixing them in different ways, etc. Being creative will help you find tons of other methods to make a perfect search query, and will save you a lot of time in filtering the results. The example above would collect leads for a designer across social media in the United States, and exclude other designers or agencies offering their services. If Boolean search sounds interesting to you, check out the complete guide to Boolean search for detailed instructions and illustrative examples. You’re most likely to be familiar with your industry keywords – these are the specific words that describe your niche. Knowing and keeping an eye on them will help you find influencers, potential platforms for guest posting, and other marketing opportunities. You’ll also be able to stay up to date with the niche trends, and boost exposure for your brand. 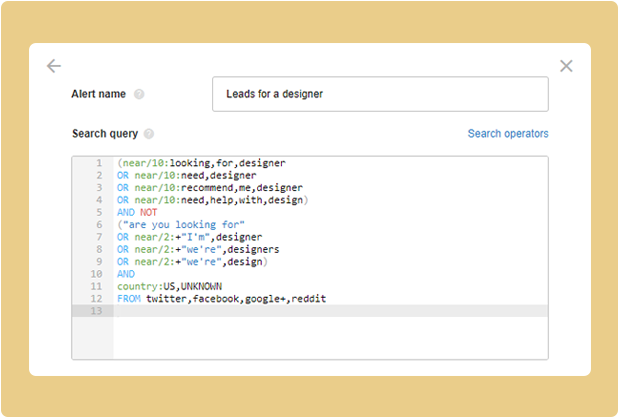 As you can see from the above screenshot, tracking industry keywords also enables you to discover and participate in relevant conversations on Q&A websites, like Quora or Reddit. This can help to reinforce the trustworthy image of your brand, and get you free advertising – provided you do it right. Paying attention to metrics alone isn’t enough for improving your social media strategy, but learning how to use them in alignment with your other statistics will enable you to see the bigger picture. 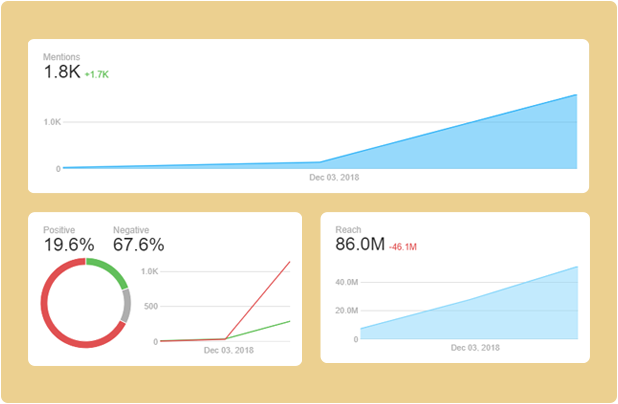 For example, the statistics from the screenshot above show that there was a spike in mentions starting from December 3rd. The percentage of negative mentions means that the brand’s reputation might be in danger – at the same time, the brand’s reach has grown, and if the negative mentions are taken care of properly and promptly, this could help to avoid serious consequences. Negative reviews give you more opportunities for attracting clients compared to positive ones. The thing is that negative feedback has a greater impact than positive, and a good follow-up on a negative review can help build an impression that your company cares about its users. While sometimes it might be beyond basic help, the audience that sees your reply will appreciate it. People will recognize that your brand does its best to solve a customer’s problem – even if they don’t know the end of the story. It’s much more fun if the tone of your answers matches your brand’s tone. 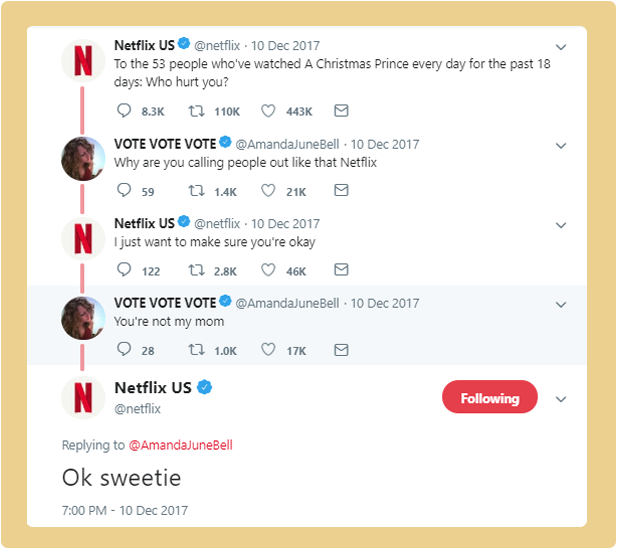 Netflix is a classic example – their answers are bold, sometimes on the verge of being arrogant, but only when they’re sure it will generate some positive buzz online. Growing the number of customers. Having the right demographic data will help you a lot with this task. Luckily, social media monitoring tools are all about that data. Most social listening tools provide you with all the necessary insight, such as location, languages your target audience speaks, their social media profiles, and influencers for your keywords. Some enterprise-level tools offer additional stats like age, occupation, and even interests of your target audience. In the example above, you can see the share of voice for three competing brands, and the distribution of mentions between social platforms. The share of voice is the parameter that helps measure how many people are mentioning your brand, while the volume of mentions for each platform helps to discover the most popular network with your target audience. When choosing the app for researching your target audience, remember that getting a historical context of your mentions is a must in this task. This list is not a panacea for all social media monitoring related diseases, but it’s a good starting point that will help to keep you away from a lot of the most common problems. Each marketer will face their own mistakes and pitfalls along the way, but do some preparatory work before starting your social listening process, and use the right tools, and you should be able to avoid the biggest slip-ups.